Getting to zero carbon or 80% by 2050 is a tough task, its going to cost money but as with anything that costs money we should careful consider the most cost effective way to get there. 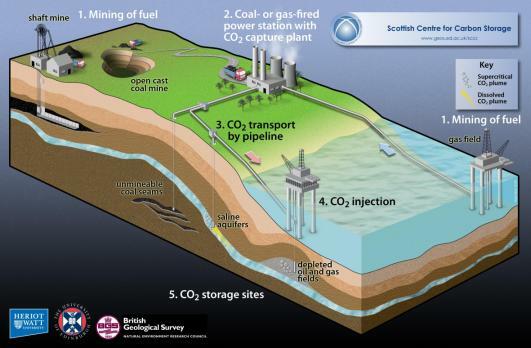 Carbon Capture and Sequestration (CCS) is a technology that has the potential to capture and store about 85% of the carbon emissions from power stations. 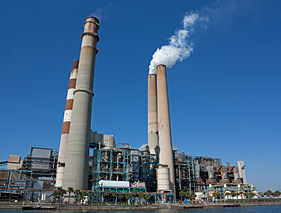 If we install CCS technology on all our Australian power stations we could reduce our grid carbon intensity from over 1kgCO2 per kWh to less than 0.3kgCO2 per kWh. Awesome. Garnaut puts it as being one of the keys to reducing Australia’s grid carbon intensity. But how much does it cost? And is renewable better? CCS – what is it and how much does it costs? In very broad terms CCS technology extracts the CO2 from the exhaust stacks of power stations, converts it into liquid form and then you pump it back into the spaces left from extracting oil and gas from the ground. It can also be injected into porous rocks under ground. It is a fairly simple concept – one that has many potential unknowns, but never the less a simple process. So how much does it cost? A recent article on Smart Planet covered the cost of implementating CCS technology in power stations in the US. Although not 100% comparable the cost of the natural resources and labour costs to construct CCS on power stations in Australia will be very similar. And that the cost of a new power plant that includes CCS technology is about 76% more than a power station without CCS. At the moment I’m going to ignore the fact that CCS reduces the efficiency of a new power station by 20-30% and that when CCS is retrofitted to an existing power station it reduces the efficiency by 40%! So how much does solar power cost as an equivalent? I’m going to use the figures for a 3MW solar power system as a comparison to a much larger 700MW coal or gas fired power station to avoid any comments about how a 700MW solar farm would be cheaper but the practical realities of installing a solar farm that big would mean that solar power is more likely to be smaller distributed systems. So, a 3MW solar power system would cost about $2,500 per kW installed and would generate about 3,300,000kWh per year of electricity in Sydney. The equivalent cost of solar power using the same adjusted for inflation calculations for a 3MW solar power system would be 7-10c per kWH, compared to the 9-15c/kWh for CCS power stations. CCS versus Solar Power – Which would you chose? Solar power is zero emissions, zero ongoing risk of CO2 leakage from storage, a known technology, a market ready technology AND its cheaper. Why would we bother with CCS? Thanks for the comment Al. The embodied water of biofuels worries me, does algae need less water than typical biofuel sources? you realise solar doesnt work at night? so either polluting baseload generation or costly storage would be needed for night and for stormy days. Having storage significantly increases the cost of solar and baseload generation in the form of coal or gas defeats the purpose (wind, hydro would be insufficient to supply our nation completely and would be a lot more expensive). With CCS working 24/7, that option is a whole lot more attractive despite its high costs. Night time is definitely a reason to consider CCS, my biggest worry is the uncertainty of will it stay sequested once we pump it into the ground. A rapid release of CO2 into the atmosphere from a failed store would be pretty bad. I think the answer is a combination of a lot of solutions rather than just CCS, or just Solar. CCS seems to be a good retrofit idea, just not convinced we should be building any new power stations regardless of whether its got CCS. Indeed. It makes sense on paper, capture carbon, stick it underground and forget about it. But, how do we know it will stay there? And what happens if it doesn’t! !